Quick Take: Supernatural, "Plucky Pennywhistle's Magical Menagerie"
Review: Supernatural, "Plucky Pennywhistle's Magical Menagerie"
(S0714) This is pure light-hearted filler, but it’s excellent light-hearted filler that’s steeped in meta (the good kind, not the creepy kind like last season’s “The French Mistake”) and just... fun. When was the last time anyone could say that Supernatural was fun? Season Five maaaaybe? You have to be careful with how you present fun on a show like Supernatural. With an overall storyline that’s perpetually in need of a prozac, randomly dumping a man in a chicken suit into the mix runs the risk of bringing too much cheese to the angst-buffet. But sometimes you just have to indulge. And yes, there was a man in a chicken suit. Sam and Dean head to Kansas to investigate what appears to be death by octopus. A death by unicorn leads them to Plucky Pennywhistle’s Magical Menagerie, a Chuck E. Cheese ripoff with an underlying pop-psychology inspired mission to help children face their fears. Plucky invites kids to draw their worst fears on a placemat to hang on his wall so that their fears can be magically transformed into rainbows and candy and bad pizza. It’s okay, Dean. I used to work at an amusement park. I would have been too busy oogling your pretty to care about the fact that you were eyeing up the children as though they posed some sort of bizarre threat to you. Speaking of summer jobs that made us want to die inside, let me just say that someone writing for Supernatural clearly has experience working with ball pits because everything about that entire sequence was sublime. The brats will always barf five minutes before you’re supposed to go home (or Daddy will lose his Blackberry and throw a hissy fit until we agree to shut down and help him look for it despite the fact that we told him not to take it in with him). The term “ball washer” makes even the most seasoned of ball pit attendants giggle. And we all occasionally wake up in the middle of the night from the old “shark-hiding-in-ball-pit-eats-hapless-park-wench” nightmare. It was glorious and I laughed until I peed a little. Yay continuity! 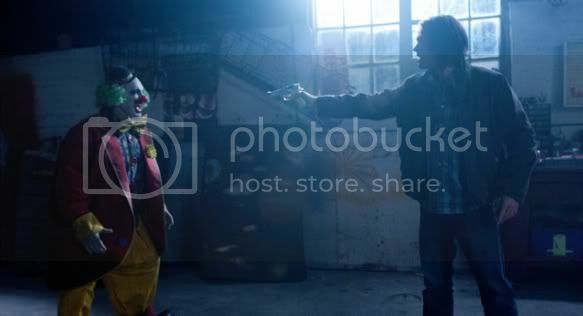 Sam’s fear of clowns was first addressed in the season 2 episode, “Everybody Loves a Clown” which, in my head, is actually titled, “Everybody Loves a Clown Except Sam.” Unicorns were first mentioned in season 4 in “Houses of the Holy” when Dean sarcastically informs Sam that indeed, they are real, and “they shoot rainbows out of their asses.” Of course, tonight’s homicidal unicorn did just that. Interspersing scenes of Sam's beatdown at the hands of the clowns with the lighter fare of the rest of the episode goes a long way towards balancing the over-the-top insanity of Plucky's with what regular Superntural viewers are accustomed to seeing on our screens. “Did you ever have a shroom in a ball pit?” No, but I once mixed a hangover with Red Bull in a ball pit and I feel like it would have roughly the same effect. The title card is altered to replace the black Leviathan goo with glittery rainbow goo. It's amazing.